In an earlier blog piece, I told you that my acting career died in a broom closet. But I lied. I mean, I took literary license. That’s allowed, you know. I pretend to be a writer both at work and here in the ‘sphere; I am allowed to lie. So there. 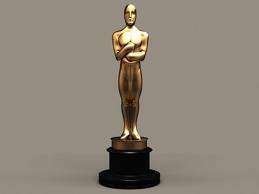 Tonight, as I watch the Academy Awards show honoring movies I haven’t seen, I thought I’d tell my new readers about the night I received my Oscars. It turned out that Jon’s father was a filmmaker. Documentary films. And while Rob didn’t know of my dreams, Carol did. So my pals presented me with two Oscars for Documentary Film-making. Sadly, not one of us had a camera. Probably just as well, because not many stars accept wearing blue jeans. He’s not heavy but substantial. I cheated and googled it and learned that he weighs 8-1/2 pounds. So I should go walking with one in each hand, and a pair strapped to my feet for a good workout! I’m still waiting on my Grammy award despite the fact that I don’t sing very well or know how to play an instrument. Don’t worry, Revis. It’ll come. I’m betting you have, Kate. Feigned politeness in a Starbucks line, perhaps? That works for me! I used to pretend my hairbrush was my Best Actress award. Close enough, right ? Of course you all did! That’s the dream! Truth is you are probably the only queen ever to win. … but you did miss some good movies this year! Might depend on your definition, Frank! Of Queen I meant! I’ll see the movies though! That was a Moment. Cherish it. Oh I do! And I didn’t have to give up my privacy! Well, of COURSE you are that good. We who read your blog have never had the slightest doubt! I am pleased to learn that the gods who oversee fictitious fabrications and dearly-held fantasies did right by you. What a nice thing to say. It actually gave me some closure because, after all, how could I do better than that! That, Elyse, is why awesome things happen to awesome people. Congrats on both your Oscars. You were finally rewarded for your xxxx years of hard work and patience. Thanks Gabe. Me and Meryl often use the same designers! Here you are, writing such a nice comment, and I didn’t get back to you until today! Thanks, PPL! Awww, shucks, VD. Now if only you could say that about my body! Years ago, I worked for a nice man who had several Emmys on his shelf. I always wanted to hold them but I didn’t have the nerve to ask. It may have been silly to want to hold one, but it was even sillier not to ask. Actually I don’t think either is silly. I bet you were taught not to gawk like I was. Had Jon’s father been there, I wouldn’t have had the nerve!